Since opening in August 2009, the UK's first produce market to be located in a train station aims to bring the best from local and artisan producers to the heart of St Pancras International. The location means commuters can pick up delicious items on their way to the office or before catching the train home - and gives our continental visitors from the Eurostar a pleasant surprise on arrival. Open seven days a week, Sourced Market is bursting at the seams with a fantastic range of carefully sourced produce. Some of the delights include free range and organic meat from Laverstock Park Farm, sustainably farmed or line-caught fish and seafood from UK waters, fresh fruit and vegetables, artisan breads, pastries and brownies from Flour Power, pantry items, olives from Olive Bar, and a range of beers and wines. Customers can eat in for breakfast, lunch or dinner. 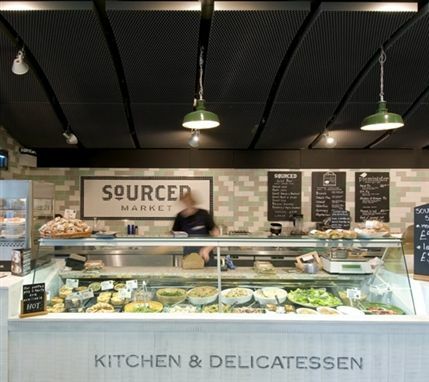 The Sourced Street Market also runs on the last weekend of every month on Venn Street in Clapham (020 7183 3251). For more information visit www.sourcedmarket.com. What are the best dining options near Sourced Market London? Sourced Market gyms, sporting activities, health & beauty and fitness. The best pubs near London Sourced Market. Sourced Market clubs, bars, cabaret nights, casinos and interesting nightlife. Where to have your meeting, conference, exhibition, private dining or training course near Sourced Market. From cheap budget accommodation to luxury 5 star suites see our deals for Sourced Market hotels, including ibis London Euston St Pancras from 0% off.